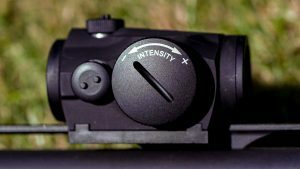 The 2018 IPSC rule updates included the addition of optical sights in Modified Division, a move which seems to have propagated a renewed interest in the Division. Optical sights were previously only available in Open but both Handgun and Shotgun now have options to use these sights on more conventional equipment. When Production Optics was being discussed for Handgun it was hailed by many shooters of a certain age as a way to stay competitive despite age related changes in eyesight and without changing all their kit and getting into exotic race guns. Those of us in Shotgun who don’t fancy a box fed now have the same flexibility. I am 51 and my optician has explained the simple facts of what he diagnosed as TMB (Too Many Birthdays), more commonly known as presbyopia! This is a gradual loss of the flexibility of the lens within each eye which reduces its ability to focus over as wide a range of distances as it could before TMB set in. The result for older shooters like me is that we need a compromise prescription in our shooting glasses, in my case my driving glasses do not allow me to see my sights well and my shooting glasses are not ideal for viewing very distant objects but do let me have a sharp front sight. All of this got me interested in Modified but January was way too close to the Worldshoot in early June for a change of equipment and I had already committed along with other competitors from my country to work on forming a national team in Standard, so Modified had to wait. A few friends had already made the move in time and while talking to people at Worldshoot it transpired that others were considering Modified for a variety of reasons. In addition to comments about eyesight / optics I also heard discussion around the idea that an initial load of 14 gives an option to start moving and shooting on a medium stage where 9 in Standard sometimes means standing to shoot targets to enable loading to begin during the movement phase. However the most commonly discussed point (after the red dot implications) centered around the idea that 14 rounds makes medium stages 0 or 1 quad loads, so the loading race is taken mostly to long stages where more distance for movement sometimes gives more time to load. We ran a poll on practical-shotgun.com’s Facebook group a couple of weeks after Worldshoot to ask what Division moves people were planning for the coming season and 28 of our IPSC shooting members indicated that they were on the move. 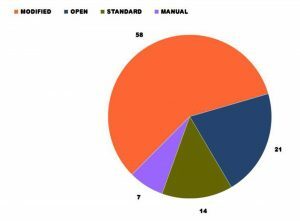 As the pie chart shows Modified is the big winner this season with 58% of those moving followed by Open with 21%, Standard with 14% and Standard Manual with 7%. The poll also showed that 71% of those on the move were leaving Standard for another Division. Another aspect of Modified is that compensators and/or barrel porting are allowed and my research in this area started when I test fired a friend’s compensated M2 during a training session in Germany this May. I had often seen the considerable effect of a compensator on very short barrelled Open guns (mostly while trying to avoid the hot gas and debris as an RO) but I wanted to try my friends 26 inch gun because I often wondered if a compensator would work well at the end of a longer barrel. We were shooting a rack with 5 plates at 15 metres and I picked his gun up, which had different sights to my own, and shot the rack on my first attempt in 0.3 seconds less than I had been consistently achieving with my own gun. I no longer needed convinced! My German friend designed and made his own compensator, he may soon make these available to other shooters and we will be reporting on this when I know more about his plans. 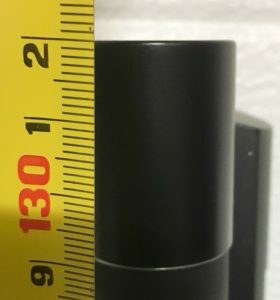 The choice of compensator is also linked to the 1320mm maximum allowable length of your gun and this was particularly critical for me because my gun has a 28 inch barrel. This meant that with a standard Comfortech gel pad I could add about 77mm to the barrel and remain legal or with a long gel pad it limited me to 68mm. I realised that I needed to see which pad would work best with my sight choice so the starting point here was to aim for 68mm and keep the flexibility for stock adjustments. Thanks are due to Mikael Kaislaranta for pointing me in the direction of a super compact solution designed by Jani Lehtonen and made in Finland by Marko Talvitie. It comes in left and right hand versions and can be customised to fit by using this order form. I ordered mine on a Saturday evening and received it by post the following Wednesday morning which is remarkable service for a made to order item. 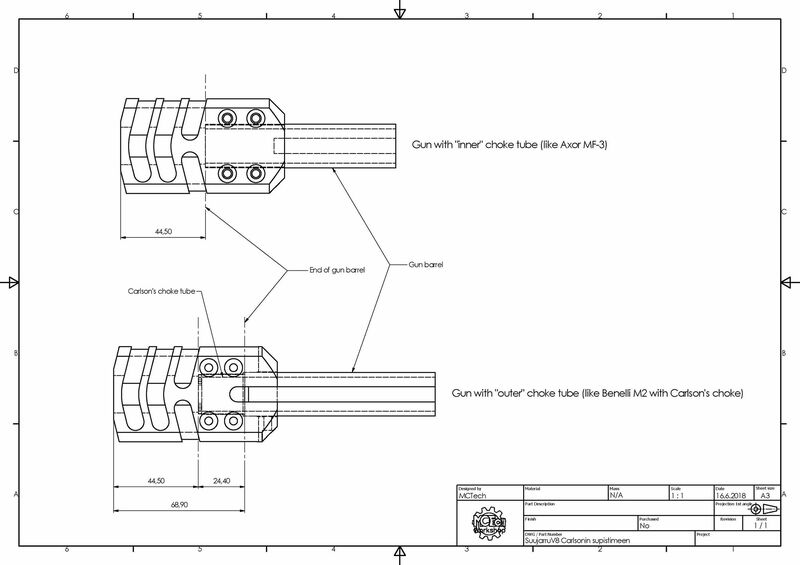 The unit clamps onto the knurled portion of an extended choke and adds a few seconds to the choke changing process but it is still under 20 seconds of work with a 3mm Allen key, the choke wrench is not needed because once the compensator is tightened the choke can not turn so finger tight is perfectly adequate. The final part of the process takes us back to the start of this article and the bit about IPSC’s 2018 rule changes adding optical sights into Modified. So which sight to buy? This is an important question and not without considerable financial implications as most contenders are in the £300-600 bracket. 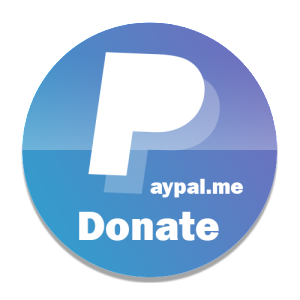 I need to start by saying thanks to Adrian at Optics Warehouse for the overnight service and for helping me with some sale and return activity which let me see products that I had not previously been able to get my hands on. My day off at Shotgun Worldshoot presented some good opportunities to look at sights, both in the vendor’s area and by catching up with some Modified shooters on the stages. 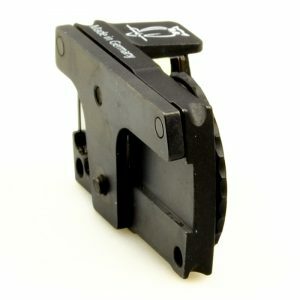 There are literally dozens of options for optical sights and of course you could stay with a rib and a bead, as many do, but I wanted to try an optic and my first decision in the process was that it needs to be a good quality item which will be reliable enough for me to travel to overseas matches with confidence. I already had a Shield 8MOA SMS which used to be on a handgun so trying this on my shotgun was an obvious first step. 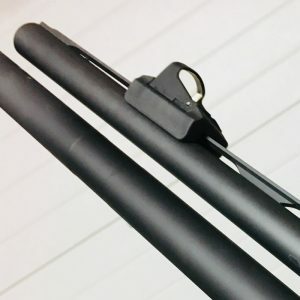 I ordered the Universal Shotgun Mount for the sight and experimented with it to get a position that I liked along the rib before tightening it down and bore sighting it in my workshop. The mount is made from moulded plastic and comes with magnetic inserts to allow easy initial positioning. As you can see in the picture I set mine pretty far forward for a familiar sight picture as I am used to using a front bead. 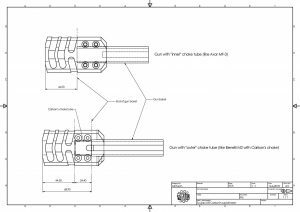 It attaches by selecting a suitably sized pair of wedges from the options provided to cover a lot of rib variations and these are forced inwards to clamp on the rib by turning a pair of grub screws that run in line with the barrel. I headed for test shooting the next day and after 9 shots it had moved a little. I will say that I had been cautious about tightening it when I fitted it and half expected this, so I slacked it off 2 turns on each clamp screw, repositioned it and did them up 2.5 turns to get a better grip. 9 more shots and it moved again, this time because it had split. I have informed Shield Sights and they have assured me that the design is now under consideration. The next option I wanted to test was the Docter Quicksight, marketed as a replacement for the front bead, it is mounted very low as well as very securely by a nicely designed integral mount which accommodates ribs up to 10mm wide. The mount plate has 2 dowels and 2 clamp screws and the entire thing although tiny feels well made, much as one might expect from German engineering. I read some reviews and some online specs before deciding to try this but what none of them pointed out was that this sight comes without any adjustment for zeroing. Probably not a problem for clay shooting but definitely a huge issue for IPSC shooters who want to get a perfect zero for slugs without resorting to shimming so I returned it. I had looked at the Aimpoint S1 in the Worldshoot vendor’s area on the advice of Teemu Rintala, who went on to win Modified using an Aimpoint. I liked the sight and thought it’s user adjustable brightness setting was a good idea but was unsure if it’s slightly larger body would make it harder for me to get used to after changing from a rib – the first two sights I had tried you probably noticed are of a very low profile design and I was drawn initially to that feature. However I thought if Teemu can not just win Modified but also shoot a higher score in the match than all but one of the Open shooters according to Practiscore combined results then it probably works well enough for me to give it a try and so the postman arrived again the next day, this time with an Aimpoint. The S1 is a shotgun rib mount sight with zero magnification and like all sights of this type works best when you shoot with both eyes open, I already shoot this way so that part was always going to be OK. My main worry was that moving to an optic would slow my first shot and my transitions, at least until I learned to use it and trained for a while. Having tested it I am delighted to report that my first shot time (normally 0.9-something at match pace and 0.8-something in training) was 0.84 and I am talking about my very first shot fired with the sight here! I tested a good few and all were in the 0.8-something range except for a few where I didn’t get the gun mounted quite right, probably from rushing. Then on to transitions and in a drill that I make 0.4 splits in with the Standard gun that I am used to I made…. can you guess? Yes, 0.4 splits with the new setup! 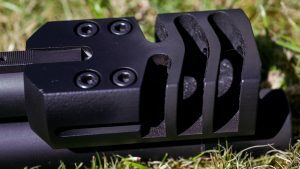 Of course the compensator helps splits too but I am delighted that such a fundamental change to the sight picture has not cost me any time at all and I am now very confident that after a few 1000 rounds I will be going faster than before. The ‘trick’ (if that’s the right word) is to look at the targets and shoot normally, just as you did with a front bead, don’t look at the optic and everything should be OK, as it was for me. The key to success here being a good fitting gun so the dot is naturally in your sightline when you mount the gun. To finish up the trial I shot some targets on the move, first from side to side which went well, then I did some advancing and retreating which went even better! Finally I shot conventional weak shoulder and then weak shoulder/strong hand (for the first time, thanks to Brian Nelson for the idea), both these went well too. The result is that any worries about the capacity of an old dog for learning new tricks are gone and I’m really looking forward to some more practice before my first match competing in Modified Senior. The Aimpoint comes with all required tools (actually all combined in 1 clever tool), a mounting kit with a selection of sturdy hardware to suit most guns and very simple instructions in the form of a two part flow chart which gets you to measure the rib for depth then width and works out the correct combo of one fixed and one moving jaw to mount the sight. With the optical axis just 14mm above the rib and with my stock already having a mid height gel comb (to suit the Toni rib which I used in Standard) the gun mounts in the perfect place for the dot to be centred in the tube. Going forward I will be competing in Modified using the Aimpoint S1 and the custom Finnish compensator on my M2 and I’m already excited about our first competitive outing together in this new Division at the Midlands Championship in two weeks time at North Cotes Butts in Lincolnshire. If you are going there please feel free look me up if you want to see the gun. 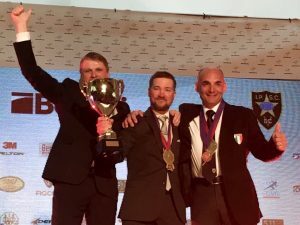 I will close by thanking all who have shown me their equipment and their shared hard earned knowledge, not least the man in the middle of this photo, Modified World Champion, Teemu Rintala from Finland. If you click the play button in the header photo you can see my first shots with the new setup.